Honore de Balzac was a famous Novelist from France, who lived between May 20, 1799 and August 18, 1850. He became 51 years old. 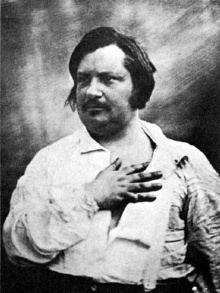 Honoré de Balzac was a French writer of novels and short stories. He is the main representative of the first great generation of French novelists like. Victor Hugo, Prosper Mérimée, Alexandre Dumas the and George Sand. After a few failed business adventure he threw himself with great energy into the literature, and wrote about 80 books from 1830 until his death in 1850. Many of Balzac's stories are part of the larger novel suite from 1842, which he called La Comedie of Humaine (The Human Comedy), the title was inspired by Dante's The Divine Comedy. This great novel series, where a network of more than 2000 persons are acting in several books, was divided into subseries as "Scenes from Parisian Life" and "Scenes from the life of the province." The grip to let people act in several books, he began to use from the Father Goriot (1835), regarded as his magnum opus. He is born under the zodiac taurus, who is known for Security, Subtle strength, Appreciation, Instruction, Patience. Our collection contains 84 quotes who is written / told by Honore, under the main topics: Love, Equality, Legal, Mom, Parenting. "A woman knows the face of the man she loves as a sailor knows the open sea"
"All humanity is passion; without passion, religion, history, novels, art would be ineffectual"
"An unfulfilled vocation drains the color from a man's entire existence"
"At fifteen, beauty and talent do not exist; there can only be promise of the coming woman"
"When women love us, they forgive us everything, even our crimes; when they do not love us, they give us credit for nothing, not even our virtues"
"Wisdom is that apprehension of heavenly things to which the spirit rises through love"
"Women are tenacious, and all of them should be tenacious of respect; without esteem they cannot exist; esteem is the first demand that they make of love"
"Between the daylight gambler and the player at night there is the same difference that lies between a careless husband and the lover swooning under his lady's window"
"Bureaucracy is a giant mechanism operated by pygmies"
"But reason always cuts a poor figure beside sentiment; the one being essentially restricted, like everything that is positive, while the other is infinite"
"Chance, my dear, is the sovereign deity in child-bearing"
"Children, dear and loving children, can alone console a woman for the loss of her beauty"
"Clouds symbolize the veils that shroud God"
"Conscience is our unerring judge until we finally stifle it"
"Courtesy is only a thin veneer on the general selfishness"
"Death unites as well as separates; it silences all paltry feeling"
"Equality may perhaps be a right, but no power on earth can ever turn it into a fact"
"Excess of joy is harder to bear than any amount of sorrow"
"Finance, like time, devours its own children"
"First love is a kind of vaccination which saves a man from catching the complaint the second time"
"For passion, be it observed, brings insight with it; it can give a sort of intelligence to simpletons, fools, and idiots, especially during youth"
"Great love affairs start with Champagne and end with tisane"
"It would be curious to know what leads a man to become a stationer rather than a baker, when he is no longer compelled, as among the Egyptians, to succeed to his father's craft"
"Laws are spider webs through which the big flies pass and the little ones get caught"
"Love has its own instinct, finding the way to the heart, as the feeblest insect finds the way to its flower, with a will which nothing can dismay nor turn aside"
"Love is a game in which one always cheats"
"Love may be or it may not, but where it is, it ought to reveal itself in its immensity"
"Love or hatred must constantly increase between two persons who are always together; every moment fresh reasons are found for loving or hating better"
"Lovers have a way of using this word, nothing, which implies exactly the opposite"
"Manners are the hypocrisy of a nation"
"Many men are deeply moved by the mere semblance of suffering in a woman; they take the look of pain for a sign of constancy or of love"
"Passion is universal humanity. Without it religion, history, romance and art would be useless"
"Political liberty, the peace of a nation, and science itself are gifts for which Fate demands a heavy tax in blood!" "Power is action; the electoral principle is discussion. No political action is possible when discussion is permanently established"
"Small natures require despotism to exercise their sinews, as great souls thirst for equality to give play to their heart"
"Society bristles with enigmas which look hard to solve. It is a perfect maze of intrigue"
"Solitude is fine, but you need someone to tell you that solitude is fine"
"Study lends a kind of enchantment to all our surroundings"
"Suicide, moreover, was at the time in vogue in Paris: what more suitable key to the mystery of life for a skeptical society?" "The more one judges, the less one loves"
"The most virtuous women have something within them, something that is never chaste"
"The motto of chivalry is also the motto of wisdom; to serve all, but love only one"
"The smallest flower is a thought, a life answering to some feature of the Great Whole, of whom they have a persistent intuition"
"There are some women whose pregnancy would make some sly bachelor smile"
"There is no such thing as a great talent without great will power"
"There is something great and terrible about suicide"
"Those who spend too fast never grow rich"
"Thought is a key to all treasures; the miser's gains are ours without his cares. Thus I have soared above this world, where my enjoyment have been intellectual joys"
"To kill a relative of whom you are tired is something. But to inherit his property afterwards, that is genuine pleasure"
"When Religion and Royalty are swept away, the people will attack the great, and after the great, they will fall upon the rich"
"It is easier to be a lover than a husband for the simple reason that it is more difficult to be witty every day than to say pretty things from time to time"
"Towns find it as hard as houses of business to rise again from ruin"
"When law becomes despotic, morals are relaxed, and vice versa"
"If we could but paint with the hand what we see with the eye"
"Old maids, having never bent their temper or their lives to other lives and other tempers, as woman's destiny requires, have for the most part a mania for making everything about them bend to them"
"True love is eternal, infinite, and always like itself. It is equal and pure, without violent demonstrations: it is seen with white hairs and is always young in the heart"
"Marriage must incessantly contend with a monster that devours everything: familiarity"
"The art of motherhood involves much silent, unobtrusive self-denial, an hourly devotion which finds no detail too minute"
"In diving to the bottom of pleasure we bring up more gravel than pearls"
"No man should marry until he has studied anatomy and dissected at least one woman"
"The country is provincial; it becomes ridiculous when it tries to ape Paris"
"The habits of life form the soul, and the soul forms the countenance"
"The man whose action habitually bears the stamp of his mind is a genius, but the greatest genius is not always equal to himself, or he would cease to be human"
"Nature makes only dumb animals. We owe the fools to society"
"Nothing so fortifies a friendship as a belief on the part of one friend that he is superior to the other"
"The life of a man who deliberately runs through his fortune often becomes a business speculation; his friends, his pleasures, patrons, and acquaintances are his capital"
"The majority of husbands remind me of an orangutan trying to play the violin"
"The duration of passion is proportionate with the original resistance of the woman"
"The fact is that love is of two kinds, one which commands, and one which obeys. The two are quite distinct, and the passion to which the one gives rise is not the passion of the other"
"What is a child, monsieur, but the image of two beings, the fruit of two sentiments spontaneously blended?" "A flow of words is a sure sign of duplicity"
"A good husband is never the first to go to sleep at night or the last to awake in the morning"
"A grocer is attracted to his business by a magnetic force as great as the repulsion which renders it odious to artists"
"A husband who submits to his wife's yoke is justly held an object of ridicule. A woman's influence ought to be entirely concealed"
"A lover always thinks of his mistress first and himself second; with a husband it runs the other way"
"A man is a poor creature compared to a woman"
"A mother who is really a mother is never free"
"A mother's happiness is like a beacon, lighting up the future but reflected also on the past in the guise of fond memories"
"A mother's life, you see, is one long succession of dramas, now soft and tender, now terrible. Not an hour but has its joys and fears"